**This post contains affiliate links and Julie Tucker from Joyful Gifts by Julie will be compensated if you make a purchase after clicking on the IdealShape affiliate links. 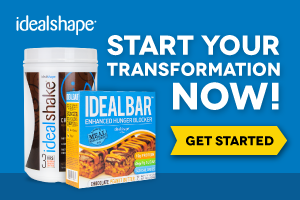 **​IdealShape Shakes and Bars Giveaway!The winner will get their choice of flavors of one jar of shakes (Chocolate, Strawberry or Vanilla)And one box of bars (Chocolate Peanut Butter, Cinnamon Caramel Crunch, Strawberry Yogurt or Double Chocolate)You will also receive a shaker cup!This is approximately an $80 value! Check out both of Julie’s reviews here–>IdealShape Review 1and IdealShape Review 2Julie also wants to let you know she is doing a review on the IdealBoost Drink and wants you to look out for her review and giveaway on that as well! Everyone has a time to do what they need to and when they are ready Ideal will be there waiting for you! If you are interested in purchasing any IdealShape Products please click on the ad below for $5 off a purchase of $29.99 or more! US entries only. Must be 18+ to enter. Giveaway ends on 10/7/2014 at midnight. Previous post: Reebok Outlet Sale 50% off and Free Shipping!